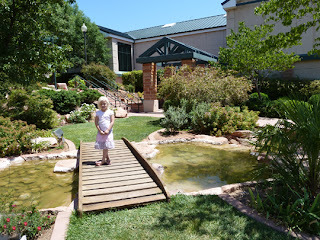 Saturday I took my daughter to our local art museum for a special "girl outing." What a way to beat the summer heat – a nice air-conditioned educational and fun outing! She's very interested in art and is quite talented, I must say! :-) Many nights she asks to talk about art. We were in NYC recently and took the kids to the Met. [Metropolitan Museum of Art.] She was enthralled with the impressionists and quite taken with a Degas ballerina bronze sculpture. It's so special to see something of "me" in my daughter, since physically I see no resemblance! Anyone else in that boat? At the end of the exhibit there was space for the kids to create their own art - with a treasure trove of supplies! 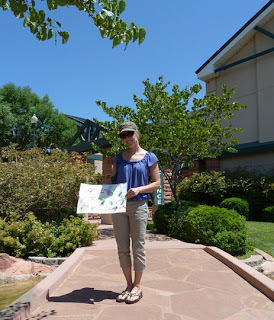 My budding photographer wanted to take my picture in the museum entrance garden holding her "mixed-media landscape" of that same spot. 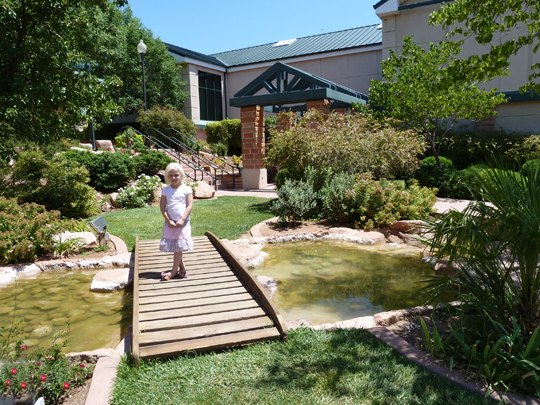 What summer escapes have you done with your kids this year? How are you beating the heat? Please share your fun, inspiring ideas! Love it! We're hoping to do a Lego exhibit at a local museum soon. Today it's building forts and playing with star wars! So fun! I'd love to see her artwork; I'm sure it's amazing. I want to see the artwork of Ava.